The Fast Find Ranger is a Personal Locator Beacon (PLB) 406 MHz with GPS, for traveler or outdoors enthusiast. The Fast Find Ranger is a Personal Locator Beacon (PLB) 406 MHz with GPS, for traveler or outdoors enthusiast. The beacon is a safety equipement for use in a emergency case, you send a distress signal to the satellites system COSPAS-SARSAT and the rescue center will send you rescue services. Worldwide coverage. 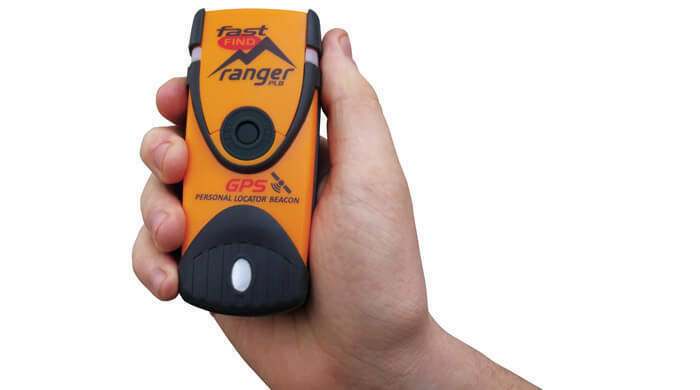 The Fast Find Ranger is a distress beacon for use in case of emergency. It allow you to be located by rescue center by transmitting a distress signal on the international 406 MHz frequency. The Personal Locator Beacon Fast Find Ranger also include a GPS chip to ensure a accurate location. Whether you're on an Alaska deep-sea expedition, climbing Everest, Mont Blanc or wherever you're hiking, kayaking or mountain biking, alone or in a group, the Fast Find Ranger personal distress beacon will provides additional safety in the event of an incident or accident. The Fast Find Ranger distress beacon, once triggered, allows you to be located and identify wherever you are in the world! With the Fast Find Ranger, you can be sure to be able to communicate your distress status to the emergency services with the coordinates of your location around the world. World coverage: Global coverage by the COSPAS-SARSAT satellites at activation: the beacon transmits an emergency assistance request accompanied by the holder's identification information and geographic coordinates in real time. Equipped with a Fast Find Ranger, in distress you can be located anywhere in the world by transmitting on the international 406 MHz distress frequency. The Fast Find Ranger individual beacon will follow you in all your outdoor activities, such as hiking, trekking and traveling, great cruising, adventure trips and providing extra security. Radiolocation of proximity: In addition to the issuance of the distress signal on 406 MHz International, the Fast Find Ranger transmits a second radiolocation signal on 121.5 MHz can be received by the aircraft in flight or a rescue center in the vicinity. GPS Location: To provide location information for emergency services and specify their well afford to act quickly, the Fast Find Ranger incorporates a GPS enabling it to calculate its position in real time. Once the position calculated the beacon, joined the geographical coordinates when transmitting the distress signal on the 406 MHz frequency. The accuracy of the location of the beacon without the information from the integrated GPS is 5 kilometers radius whereas with the accuracy is 62 meters. Great autonomy: The Fast Find Ranger is a safety equipment, so the use of the battery is preserved to provide optimum performance when used in a distress situation. The Lithium Manganese offers a wide autonomy in transmission, at least 24 hours in extreme weather conditions (eg -20 ° + strong wind) and 35 hours + 10 °. The battery of your Fast Find Ranger will arrive at its expiry date, 6 years after the date of purchase. The beacon has a functionality to perform a self-diagnosis of the battery status. If you have made extended use of the beacon during distress and self-diagnosis indicates a low or insufficient battery charge level, you can order a service situation, complete check and battery replacement, available in the Tab 'accessory'. Replacing the battery after activating the beacon. Stroboscopic flash: The Fast Find Ranger beacon has a strobe LED that emits the international SOS Morse distress signal. It is an efficient way of spotting light; For rapid visualization when rescue services are on approach. The number of flash sequences is limited to preserve the use of the battery in transmission to the satellites. Waterproof: The Fast Find Ranger is designed to be waterproof; It has been designed to follow you every time you travel to ensure your safety; Whether on adventure trips or in the practice of your outdoor activities; Such as hiking, trekking, kayaking. The beacon does not float without using the optional neoprene pouch available in the accessories. Without subscription: There is no additional fee, no subscription, and the registration of the beacon in your name is free and available online in minutes, administration of your data is free and insured by a state agency. Emergency activation: The activation button and the antenna of the beacon are protected by a so-called sacrificial hood to avoid accidental activation. The Fast Find Ranger personal distress beacon must be activated only in the event of an incident or accident that endangers human life. Safety equipment for all: The Fast Find Ranger is an easy-to-use individual distress beacon that can be quickly activated in 3 steps: pull out the top cover, deploy the antenna with a finger and press the activation button. A small memo card is delivered in the packaging of the product, it is advisable to always keep it in the yellow pocket at hand. Free registration: You must purchase your Fast Find Ranger programmed for a registration in your country of residence. We use your billing address to provide you with a programmed beacon based on your country of residence. The registration of your newly found Fast Find Ranger is free, simple and takes a few minutes on the internet. If you have any questions, technical or on the registration in France or in another country, you can contact us or add a comment during the order process. Contact form. Vaïma is the exclusive European distributor of the Fast Find Ranger PLB 91-001-420A.